Vita Toscana prides itself is fashioning homes that allow families to live together in exclusivity, safety and beautiful surroundings. It is indeed the perfect choice for a dwelling that redefines a lifestyle of luxury and a legacy one can truly be proud of. 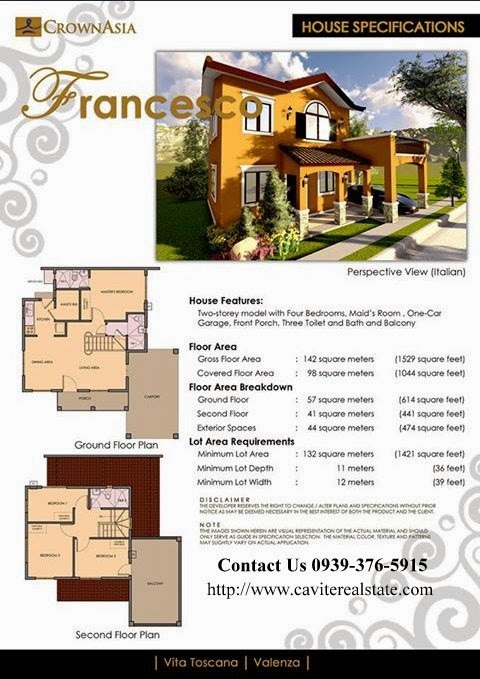 Minimum Lot Area: 132 sqm. 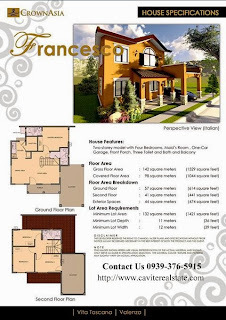 2-Storey Model with 4-Bedrooms (Master's Bedroom at the Ground Floor), Maid's Room, One-Car Garage, Front Porch, Three Toilet and Bath, and Balcony . Please check the estimated sample computation below for reference . Prices (TCP) above are already inclusive of 12% VAT . Prices are inclusive of 6% MCC. 50% of the Reservation Fee will be forfeited . and/or change any error that may appear on this pricelist . Life is best lived in the safety of your family's embrace . 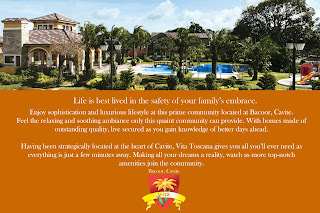 Crown Asia is proud to enter with Vita Toscana newest house model FRANCESCO . Enjoy sophistication and luxurious lifestyle at this prime community located at Bacoor City, Cavite . Feel the relaxing and soothing ambiance only this community can provide . With homes made of outstanding quality, live secured as you gain knowledge of better days ahead . top-notch amenities join the community .